Arranged next to your bed, our handcrafted Royal Mission Nightstands provide timeless beauty and ample storage space for all of your bedside essentials. The classic Old World Mission design is crafted from solid hardwood and finished with a beautiful stain that will allow the natural grain patterns of the hardwood to provide elegance to any bedroom suite you choose. Standard with the piece, a solid 1" top is perfect for housing your must-have nighttime items. Below, three ebony inlays line the front, leading down to the flush-mounted, flat-front drawer that is perfect for storing anything else you may need for the night ahead. Open, this drawer shows of the quality dovetailing of the solid drawer box, complete with high-quality ball-bearing slides that allow full extension away from the case of the piece, and complete access to all of your items inside. On each side of the piece, beautiful corbels accent the slatted details that surround the lower shelf, offering a true antique feel to the piece. The lower shelf expands your storage, as a convenient place for grab-and-go items or accent decor for your bedroom suite. 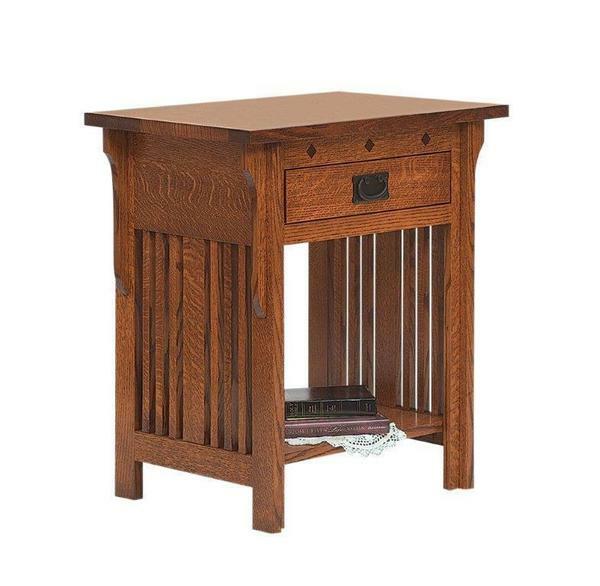 Customize this piece by choosing from a wide array of solid hardwood for the nightstand. Once you've selected your hardwood preference, a wide array of stain samples are available to bring out the true beauty of the hardwood's grain. Finished with a high quality varnish, your new nightstand is ready for generations of continued use and enjoyment. Select the classic Mission pulls, or a different hardware collection to add the finial details, and your personal touch to the piece. Each piece is made to order and offers a wide array of options to make this piece your own. Along with the hardwood, stain, and hardware choices, there are a few more options that will add functionality and beauty to your nightstands. Drawer Slides - The standard side-mounted slides can be changed out for undermounted slides that are located under the drawer box to create a unique, floating drawer look that is one-of-a-kind. Each upgraded slide also features a soft-close addition that will engage when the drawer is shut to a certain point, gliding it completely to a silent close. Three Plug Power Strip - Add extra outlets to your space with this convenient addition. Helping to eliminate a clutter of cords, this power strip is mounted the back of the nightstand and offers a place to plug in three of your bedtime necessities, in one easy to reach location. LED Nightlight with Touch Switch - Helping to ensure your safety, while keeping your partner sleeping quietly during a midnight trip out of your bed, this convenient one-touch nightlight will illuminate the floor under your nightstand and provide much needed light to your bedroom. The LED technology is sure to last many, many years. Cedar Drawer Bottoms - Added to your drawer bottom, the beautiful aromatic cedar will naturally draw moisture from your items and incorporate a fresh scent, every time you open your drawer. *We can also tailor this piece to fit your space and your unique needs. If we are close, but missing a few details on the perfect nightstand for your space, give us a call for a free custom quote. Our furniture specialists are available to answer any questions, send you a custom quote, provide wood and stain samples, and help you start your order by phone. Give us a call to discuss your options - Toll-Free (866) 272-6773. Not only am I pleased with the quality, but the packing was done perfectly as was the shipping! Such a pleasant experience to work with you all!